How exactly does one hitchhike in Antarctica, you ask? It's complicated but very interesting and not quite impossible. Our yacht for the six-week Antarctic trip was the Icebird out of Australia. Over a year ago, my husband Ralf Dujmovits and I received an email from an Australian friend, Damien Gildea, that went something like this: ‘How would you like to go on a six-week long, deep-discount trip to the Antarctic Peninsula? 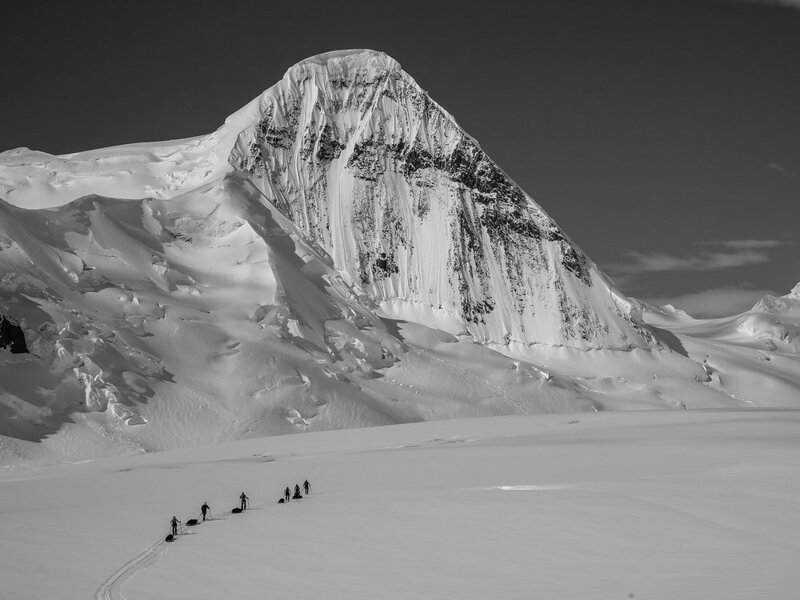 All you have to do is help a ski group get their gear up to the Antarctic Plateau, back down again at the end of their traverse, and provide rescue services in case they need it. 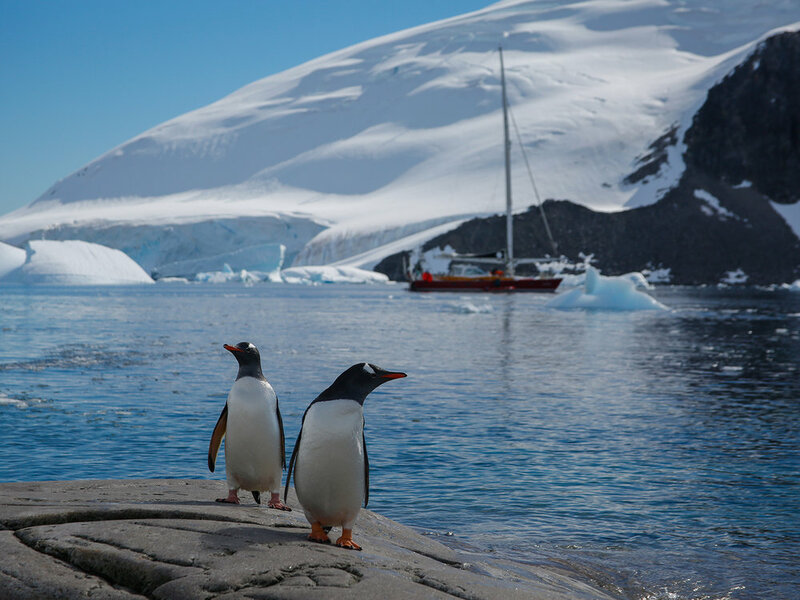 In between, the yacht is yours with which to explore, ski, climb, and play with penguins and whales.' It took Ralf and me approximately ten minutes to answer, "Yes, please! We would like that very much!" What a start to the honeymoon! Photo by Alex Jara. As luck would have it, the trip also became our honeymoon. Being crowded onto a 17-metre yacht with eight strangers while crossing one of the wildest stretches of ocean on the planet might not be everyone’s idea of an awesome honeymoon. While it wasn’t always romantic, it was certainly memorable. After the 3.5-day crossing of the Drake Passage, we arrived in perfect weather at the traverse team’s starting point. They were a group of six adventurers from around the world: Australia, France, Belgium, Canada, and England. With Ralf coming from Germany and the yacht’s assistant from Spain, we had quite the international team! A spectacular start to the traverse with heavy sledges and high hopes. We spent the next seven days moving hundreds of kilograms of gear 35 kilometres and almost 2,000 metres up to the plateau. It was hard work, but somehow we all made it. After saying our farewells and giving our best wishes to the group (and silently begging them to not require our rescue services), we zoomed back to the yacht in a day, ready to begin the next part of our adventure. Mt. Cornu (1,549 m) along the way to the Antarctic Peninsula Plateau. Sea kayaking amid ice and seracs. Photo by Ralf Dujmovits. Our tired legs gave a sigh of relief when Cath, the yacht’s Australian skipper/owner, suggested a day of sea kayaking. Having previously canoed only twice and kayaked exactly never, I was a bit nervous to start in a place with arm’s width passages between towering icebergs, random whale surfacings, and massive ocean-side serac falls. It turns out that if you don’t get flipped over by one of these objective hazards, the boats are quite stable and you can easily avoid a quick ending in the icy-cold Antarctic waters. Getting high on Mt. Hoegh. Photo by Ralf Dujmovits. It was time to look for something to climb or ski. 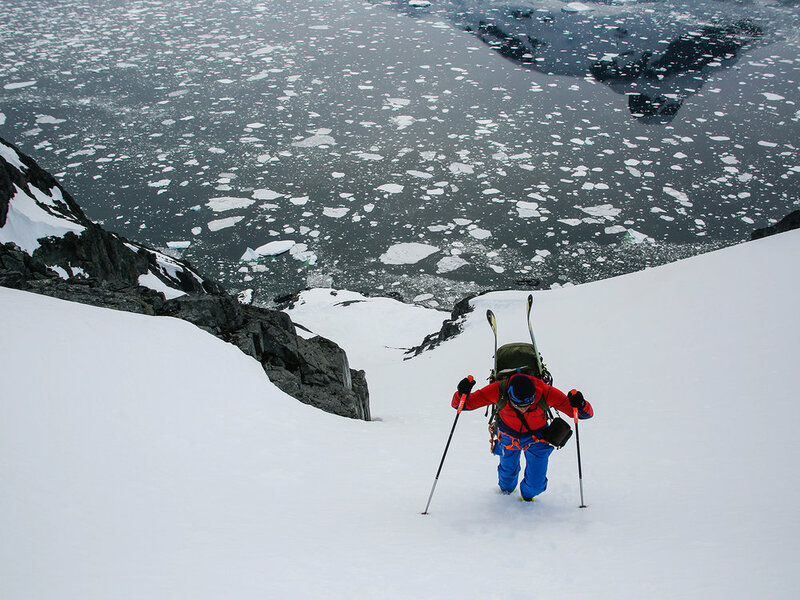 We motored south along the spectacular Antarctic Peninsula coastline towards the aptly named Paradise Bay where we stopped for a ski ascent of Mt. Hoegh (890 m). This ski tour took us literally twice as long as it should have due to the beautiful surroundings. I don’t think we covered 50 vertical metres in a row without stopping to take photos. Our hope had been to climb the snow and ice line that comes up just left of the highest point. Moving further south, we searched for a nice snow, ice, and/or mixed line to try. Ralf and I had many ideas from research we had done, but as Damien Gildea had warned us, many amazing-looking lines end in either a huge cornice or overhanging serac. We finally saw a lovely and non-threatened route to a summit on Booth Island in the Lemaire Channel. We were excited to try it, but also doubtful because of the warm temperatures. It was barely going below zero at night, and our ski experiences had revealed that the snow below 500 m was isothermal. But, we had come to try and climb something, so try we would. We quit after just 350 m, already sinking up to our crotches on the descent. Motoring further south that same day, we pulled up to an ice floe topped with five Weddell seals and tons of penguins. The penguins hopped off when we got onto the ice floe and they didn’t return until everyone left the floe except for me. They are truly the funniest, most animated, strangest little creatures you can imagine. Motoring further south that same day (it was quite a day! ), I volunteered to sit at the top of the 25-metre-high mast to help navigate through the maze of sea ice. My two hours up there turned out to be yet another “best experience ever” on this trip. Cath suggested another ski tour for us – Mt. Demaria (~800 m). It was one of the most unique ski tours Ralf or I have ever done. From the sea to the summit, the angle ranged from 30 to 45 degrees without pause. The other three sides of the mountain were all vertical rock faces. This was a no-fall tour – a slip would have resulted in a very long and fast slide directly to the ocean. Before our trip, I had absolutely no idea that we could or would visit some of the Base Stations. Our next stop was at Vernadsky – the Ukranian Base. Eleven men had been there over the Antarctic winter and, happy to see new faces, they were extremely hospitable. 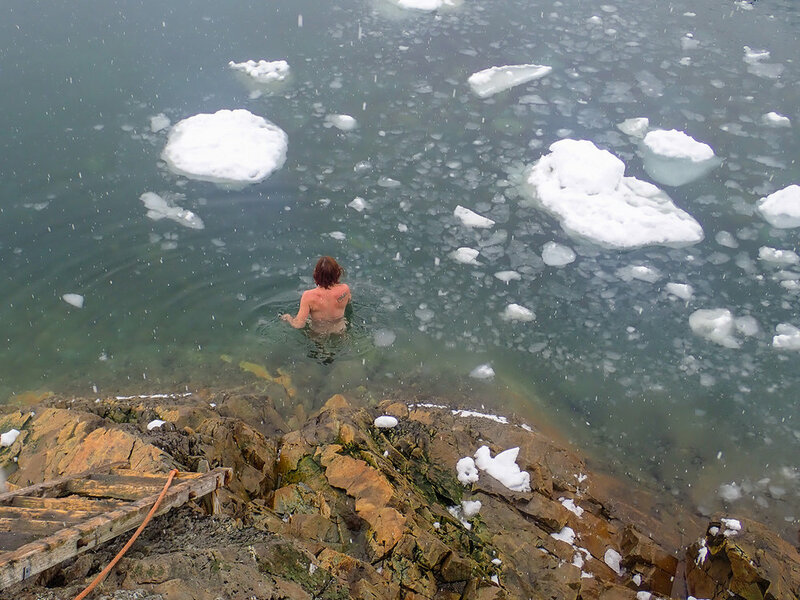 We happened to be there on one of the two days per year they jump into the Antarctic Ocean. Cath and I did it by using the hot-sauna-assisted cheaters’ way, but I can tell you that the water is still cold! Brrrrrr!!!! Photo by Cath Hew.